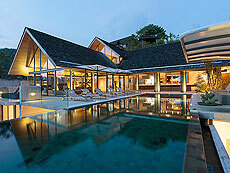 Saengootsa is in the Samsara Estate where located at close to Kamala beach area in Phuket. In the villa decorated with slightly warm furnishing and colorful art painting. You could feel full of natural light comes through into the villa and generous sea views during the villa stay. Saengootsa have 5 bedrooms, game room, well equipped audio system room etc... These facilities suitable for friends and families stay but also good for corporate group usage.